"The greatest thing about working on a Spider-Man game is that you're working on a Spider-Man game. The hardest thing is that it's a Spider-Man game." Okay, at first blush this seems like one of those embarrassingly shallow quotes people post to their Facebook walls and Instagram feeds to look deep and contemplative, but I think it's easy to see the truth behind the intent here; Insomniac is super-excited about the project and know how much people love the character. But they also seem to recognize that it's trickier to make a good Spider-Man game than many may think, and there's a lot of pressure to do this one right. "One of the most compelling things about Spider-Man is when Peter Parker and Spider-Man's worlds collide." This sentiment gets repeated a lot by Insomniac staff, and I'll say that personally, I very much agree. One of my personal favorite Spider-Man arcs is "Back in Black," where Peter hunts down an assassin who nearly killed Aunt May in the aftermath of revealing his secret identity during the Civil War event. Spider-Man: Homecoming weaves together Peter's life as a high school student and as a superhero as well. Spider-Man PS4 uses the villain Mr. Negative as a connection between the two worlds, and will hopefully be just as engaging. "We always think of Spider-Man as the acrobatic improviser." 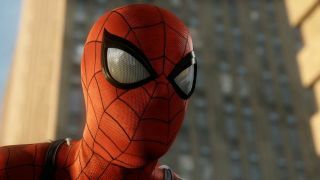 Web-swinging and other gameplay from Spider-Man PS4 has been so smooth that people have been wondering just how on-rails the game is. But according to Insomniac, that illusion comes from focusing on Spider-Man as someone who can gracefully change tactics mid-fight or mid-swing. His superhuman agility and reflexes just make it look like he meant to do that all along. "So many people have their own vision of what Spider-Man should look like, what he should sound like, and in the end we just have to put a new and fresh twist on who he is." Roughly translated: the big white emblem is staying. Sorry not sorry. Curious to learn more about Spider-Man on PS4? Insomniac has been answering fan questions since the reveal, and say that the open-world map will be "four to six" times bigger than its last.